Hiroshi Miyamura was born on October 6, 1925, in Gallup, New Mexico. He was drafted into the U.S. Army on February 29, 1944, and was assigned to the 100th Infantry Battalion of the 442nd Infantry Regiment. Miyamura did not see combat during World War II, having arrived in Europe just as the war ended, and left active duty on July 18, 1946. He then joined the Army Reserve. Miyamura was activated on September 21, 1950, and soon left for service in the Korean War where he served with the 7th Infantry Regiment of the 3rd Infantry Division. CPL Miyamura was captured by the North Koreans on April 25, 1951, and was held as a Prisoner of War until his release on August 20, 1953. 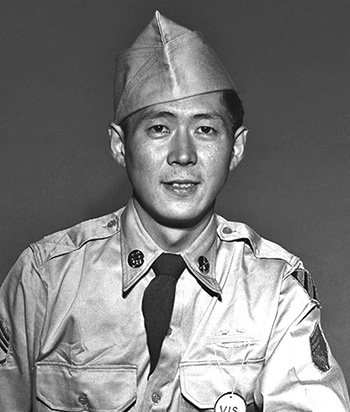 Miyamura received an honorable discharge from the Army on October 10, 1953, and was promoted to Staff Sergeant and awarded the Medal of Honor by President Eisenhower on October 27, 1953. Hiroshi Miyamura is married to the former Terry Tsuchimori and they have three children and four grandchildren. Cpl. Miyamura, a member of Company H, distinguished himself by conspicuous gallantry and intrepidity above and beyond the call of duty in action against the enemy. On the night of 24 April, Company H was occupying a defensive position when the enemy fanatically attacked threatening to overrun the position. Cpl. Miyamura, a machinegun squad leader, aware of the imminent danger to his men unhesitatingly jumped from his shelter wielding his bayonet in close hand-to-hand combat killing approximately 10 of the enemy. Returning to his position, he administered first aid to the wounded and directed their evacuation. As another savage assault hit the line, he manned his machinegun and delivered withering fire until his ammunition was expended. He ordered the squad to withdraw while he stayed behind to render the gun inoperative. He then bayoneted his way through infiltrated enemy soldiers to a second gun emplacement and assisted in its operation. When the intensity of the attack necessitated the withdrawal of the company Cpl. Miyamura ordered his men to fall back while he remained to cover their movement. He killed more than 50 of the enemy before his ammunition was depleted and he was severely wounded. He maintained his magnificent stand despite his painful wounds, continuing to repel the attack until his position was overrun. When last seen he was fighting ferociously against an overwhelming number of enemy soldiers. Cpl. 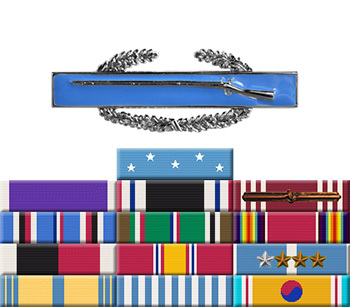 Miyamura's indomitable heroism and consummate devotion to duty reflect the utmost glory on himself and uphold the illustrious traditions on the military service.